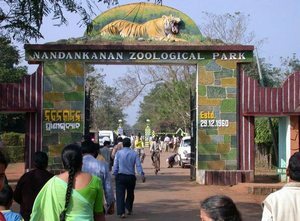 Nandankanan National Park is one of the biggest zoo in Odisha. It can be spotted close to Bhubaneswar, as you travel 20 Km. You find it amidst the Chandaka Forest, where Nature can be discovered in full groove. With Kanjia Lake encompassing some of the part of this zoo and a botanical garden adding to its significance, Nandankanan Wildlife Sanctury is real wonder. Because of the immense popularity of this park among tourists, this park enjoys the name of being the ‘Garden of Pleasure‘. One can also spot fresh water ships galore in this park as you visit 34acquaria located in this park. Moreover, an array of reptiles including snakes, crocodiles, turtles, etc. can be found crawling over the surface of this zoo. And they are more than enough to make you awestruck. Endangered species also add to the list of the habitants filling the animal crowd of the Nandankanan Wildlife Park. One can spot Nilgiri langur, Sangal Lion, Asiatic Lion, etc. that make it completely breathtaking. Wildlife lovers who crave to see White Tiger would be more than pleased to discover how safely and caringly this Nandankanan Wildlife Sanctuary has preserved this beautiful specie. And you would definitely be surprised to discover that apart from endangered species, there exist a total of 166 species that comprise of a variety of birds, mammals as well as reptiles. One can also enjoy adventures including safaris, boating, etc. while visiting this sanctuary. Therefore, don’t waste any more time and plant to head towards the Nandankanan National Park today only. You can see other Wildlife Parks in Odisha. Give Responses for "Nandankanan National Park"